The market for solar water heating in Brazil is growing and consolidating in recent years. In 2009, the first estimate of the solar industry is that has been installed more than 771 thousand square meters of solar collectors, accumulating a total area of 5.2 million square meters. 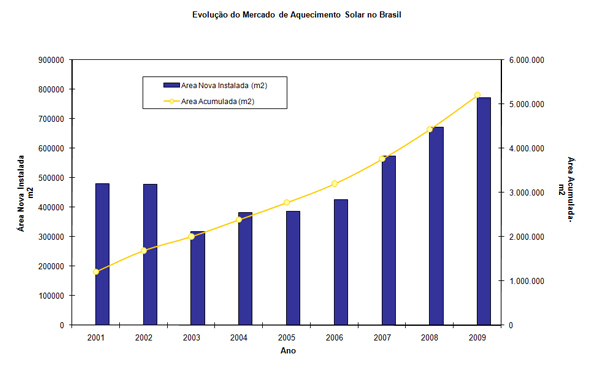 The graph in Figure 1 shows the evolution of the solar heating market in Brazil since 2001. According to the methodology of IEA (International Energy Agency), this represents a thermal power of 3641 MWth, which puts Brazil among the top ten markets for solar thermal energy in the world. However, only 2.03% of Brazilian households are using solar heaters, and Brazil has only 27.11 m2/1000 inhabitants. The Brazilian government and society need to understand and put the solar as a priority within the environmental and energy policy. According to the National Plan on Climate Change Ministry of Environment (www.mma.gov.br), the goal is to reach 15 million square meters of solar panels in 2015, a still small number compared to energy and environmental needs in Brazil. In Brazil, the use of electric showers for water heating is widespread as in no other country in the world. This practice has intensified in the 70's, with the oil crisis and the promotion of the use of electrical equipments. During this decade, Brazil has begun the construction of several hydroelectric facilities, with excess energy in the market, and no imminent concern about the use of these showers and other appliances that use electricity. Even with this surplus, is a "criminal" use electricity so rich and expensive to generate hot water at low temperatures. Yet the Brazilian society has created conditions for such equipment were widely disseminated in the Brazilian households. However, long-term technology solution that brings a host of ills for the electricity sector, especially in peak hours when electricity demand reaches its peak every day. PROCEL (National Program for Electricity Conservation - www.procel.gov.br) estimates that there are more than 30 million electric showers installed in Brazil. These facilities, in addition to consuming about 6% of all electricity produced in the country, account for approximately 18% of the peak demand of the national electric system, or nearly 20,000 MW of hydro and thermal power plants are fired in time end only to turn the electric showers and with this fill the bath today unsustainable Brazil. It is noteworthy that the total consumption of electricity in Brazil, 3% are consumed by the sanitation sector (Source: ABAE - Brazilian Water and Energy) and an additional 2.7% is used for public buildings (Source: MME-Ministry Mines and Energy). This means that to heat water , Brazil are spending more power than the sum of all energy consumption in the sanitation and public buildings and reveals the importance of a solar thermal Brazilian platform. Make this enormous potential in a solid industry of solar panels that generate technological development, as well as employment and income suggests a policy priority for national policy. With this solution the intelligent solar enables society to walk from an extremely expensive and complex system where it is necessary to generate, transmit and distribute electricity for a simple system with a short chain of values, since the sun, generates, transmits and distribute energy in a free and clean way. This fact is clear in Figure 2. The 5.2 million square meters of solar collectors installed in Brazil represent a savings to the country equivalent to the cost of building a power plant with an output of 892.7 MW, ie the solar heaters have saved into the coffers of Brazil more 2.6 billion reais. Besides the economic benefits the environmental benefits are obvious, since solar heating is without a doubt the cleanest available technology to produce hot water. Only in 2009, the solar panels reduced by more than 100 thousand tons of CO2 emissions in the atmosphere. The growth of the Brazilian market of solar water heating has always been supported with quality programs created by the government. 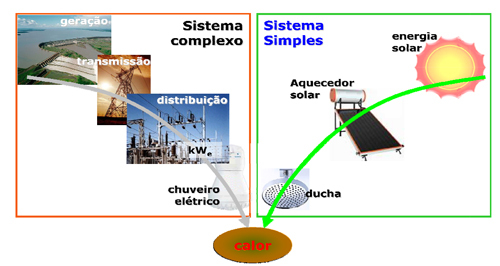 Today the industry has two quality programs in partnership with INMETRO (www.inmetro.gov.br), the Brazilian Labeling Program to Solar Equipments, established in 1998 to test the solar collectors and heat reservoirs and Qualisol - Labeling Program to Suppliers, designers, dealers and installers of solar heating systems. In these programs, CB55 (technical committee) of ABNT (Brazilian Association of Technical Standards), has been working on development and improvement of all existing standards of Brazilian sector of solar heating. In 2009 came into force on NBR-15569, a standard track and innovative providing all the criteria for quality in design, design, installation and maintenance of solar heating systems. Solar heating is already used in Brazil to success in all sectors of the Brazilian economy, whether in the residential, commercial or industrial. Where there is need for hot water up to 80oC, without a doubt the solar heating is the vast majority of cases the best option for energy, social and environmental. The use of solar heating on Housing of Social Interest (HIS) is already a reality in the country and it is estimated that more than 40 thousand HIS already using the technology. The following figures show some of these experiences now financed mostly by the electricity sector through funds earmarked for energy efficiency programs. The Brazilian government issued a decree 93 of 24 February 2010, which provides for the purchase and sale of properties Program My Home My Life (PMCMV) states that "the projects of enterprises located in cities in South, Southeast and Central West of Brazil may include solar heating systems "and that" the maximum purchase price of the units can be added the cost of acquisition and installation of solar heating equipment, including hydraulic services. 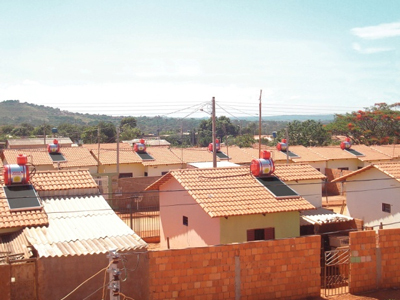 The same ordinance limits the range of investment in solar water heaters, saying that "the total cost for deploying solar energy system will be limited to R $ 2,500.00 for each dwelling unit in multifamily developments vertical and R $ 1,800.00 for each housing unit developments in horizontal. 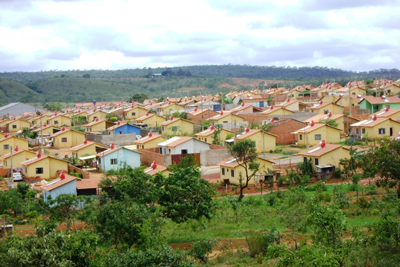 The Program My Home My Life (PMCMV) aims to build 1 million homes in Brazil. If local governments, manufacturers and suppliers of solar equipment take seriously this ordinance, the outlook for the use of solar heating in this sector will change. In HIS in the solar heating is greater than a benefit for the energy sector and environmental factors: an increase in family income, because in general the electric shower only accounts for 50% of the electricity bill of these families. For families who earn between 1 to 2 minimum wages, increased monthly family income can be up to 20% due to the economy with the solar heater. The Solar Cities Initiative (www.cidadessolares.org.br) was established in mid 2005 as a result of the partnership Vitae CIVILLE, Instituto Ekos, an association of manufacturers of solar equipment and since its inception has the support of Procobre. The design of the study was based on the identification of the main barriers that the market is presented to the full development of solar heating. Among these, the research pointed toward the old and wrong building codes of the cities and less efficient ways to design the buildings in the country that still mostly are made without considering the phases of the project, the concepts of rational use of energy , water and waste. Coupled to this, Brazil, even exceptionally continued sinning by not developing in any sphere (federal, state and municipal) proposals for public policies that encourage solar energy. With that since 2005, the initiative is proposing and monitoring the development of laws that make mandatory the use of solar water heaters in new buildings in Brazil. The City of Sao Paulo was the first Brazilian capital to make mandatory the use of solar water heaters in new residential buildings, commercial and industrial and more than 80 cities in the country already has in their legislative chambers similar projects. In Brazil there are already 22 cities with laws making it compulsory solar water heater and 22 cities have incentive programs. Unfortunately, Brazil does not have a national building code to allow for compulsory use of solar heating in the whole country and the federal government does not understand technology as a priority policy of the energy and the environment. The Solar Cities initiative was perhaps the initiative with greatest impact for the development of solar heating industry in Brazil. Perhaps the biggest impact has been to awaken the construction industry and architecture start to think to think of buildings not as a unique element of profit and aesthetics but as an element of very high impact on the lives of cities that can and should enter into his concept of clean and sustainable technologies, such as the solar heater. The vision of our society must be careful, because the thermal solar energy is undoubtedly the most appropriate technology to meet every demand for heating and cooling of buildings in the coming decades.